The Indian National Congress (INC) and the All India Muslim League (AIML) were both greatly weakened by the collapse of the Khilafat Movement and Gandhi’s non-cooperation movement (1919-1923). Though Muhammad Ali Jinnah had rejected the idea of joining any of the movements (which played out together), he felt deluded by the state of Indian politics in the immediate aftermath of the collapse of both the movements. He soon flew out to the UK where he decided to stay until his return in the mid-1930s. Much had changed and was changing in the spheres of Muslim politics in India. The Muslim community was engulfed by a sense of disorientation. The agitation witnessed during the Khliafat Movement had hurled the community out of the paradigm designed for it by progressive educationist Sir Syed Ahmad Khan and deeply politicised the community. The Khilafat Movement was started by Ulema groups and pan-Islamists after the defeat of Turkey’s Ottoman regime in the First World War. The movement demanded that the British should not allow the dismantling of the Ottoman Caliphate. Following the disastrous end of the movement, Muslim political leadership was weak and fragmented, scattered between a debilitated and fractured Muslim League, and religious groups who had been radicalised by the commotion. From this tension emerged a man who would become the second major figure in the evolution of Muslim nationalism in India after Sir Syed Ahmad Khan, and, consequently, that of Pakistani nationalism. Muhammad Iqbal was a poet and a philosopher of considerable intellectual prowess. Though he had initially supported and then joined the Khilafat Committee (in Lahore), his stay in it was short-lived. He resigned from the Committee after accusing its leaders of being ‘overtly sentimental’. He then went on to deride the Ottomans for ‘being a shame to the Muslims’. In fact, he believed that the fall of the Ottoman caliphate in Turkey could be catalytic to the emergence of a renaissance in Islam. He also applauded the takeover of Turkey by Mustafa Kamal — a secular nationalist who abolished the caliphate and declared Turkey to be a modern republic. Even though, later on in life, Iqbal would begin to alter his views about Kamal’s reforms, for a while he did see the new Turkish republic as a dynamic political and social model of Muslim evolution — the sort which should be emulated by the Muslims of India. Police parade arrested Muslim peasants in Mopla after their uprising was crushed during the Khilafat Movement. 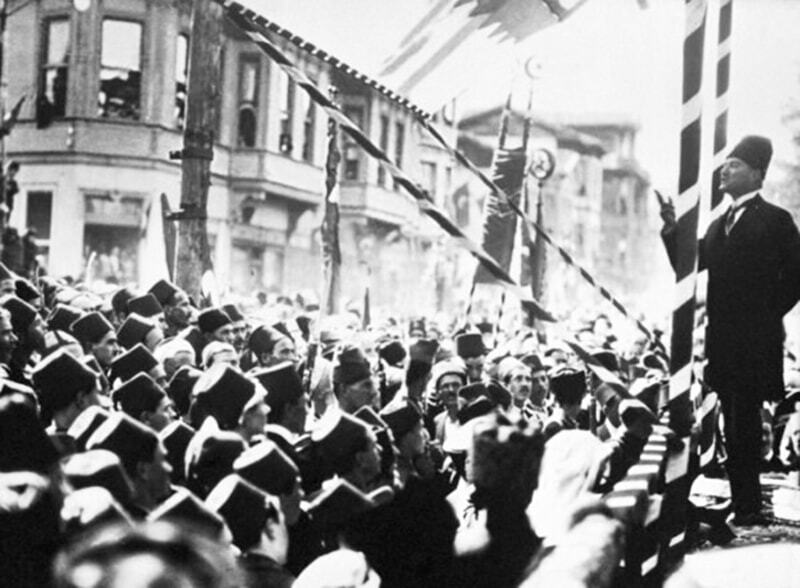 Mustafa Kamal speaks to Turks after abolishing the Ottoman Caliphate and declaring Turkey a secular-nationalist republic. Iqbal became increasingly aware of the nature of the changes which had swept across India’s Muslim community after Sir Syed Ahmad Khan’s reformist movement in the late 19th century, and then during and after the eruption and collapse of the Khilafat Movement. By the 1920s, a Muslim business class had emerged. Historians such as W.C. Smith suggest that this class began to find many of its avenues (of growth) ‘blocked by the Hindus and the British’ and its members ‘could not develop large-scale capital’. This was one overriding reason why the Muslim business class had supported the Khilafat Movement. A Muslim middle-class too had emerged, largely from within the paradigm and rules of engagement drawn by Sir Syed Ahmad Khan. In the early 20th century, the educational progress of the Muslims was quite rapid. Many teachers, lawyers, professors, military officers and bureaucrats were recruited from this class. Most of them were aligned with the politics of the Muslim League. In the aftermath of the Khilafat Movement, these two classes were feeling extremely vulnerable. As a consequence, some sections of these classes hurried out to support radical Islamic groups which had emerged from the Khilafat Movement; whereas the rest tried to figure out what course Muslim politics would take after the League had been weakened by infighting, and when the hopes of communal harmony and anti-British politics raised by the movement had shattered. Iqbal would become the intellectual by-product and expression of this turmoil which was whirling within the Muslim community after the Khilafat Movement had buckled. More than just an expression, he became a (possible) answer. Till 1905, Iqbal had been a passionate Indian autonomist. He was a strong proponent of wataniyat or love of the territorial homeland. He often wrote about his despondency over the rising strife between the Hindus and Muslims of India. By the time the Khilafat Movement had begun to implode, Iqbal was convinced that the Muslims of India required a new expression, one which should emerge from ‘individual autonomy’ and was not chained to the worldview of the religious guardians of Islam. Iqbal was conscious of the fact that the Muslim community in India was evolving with two competing sets of ideas: one which encouraged the community to embrace western education and political concepts to regenerate itself as a separate cultural community, and one which explained this community as part of a global Muslim community (ummah) striving to cleanse itself and move towards the formation of a pious caliphate. Iqbal uniquely merged the two tendencies to come up with a complex synthesis which would go a long way in adding a weighty ideological dimension to the Muslim League, and, eventually, become an important building block in the construction of what would become Pakistani nationalism. Iqbal thought highly of Sir Syed Ahmad Khan. He praised Syed for being the first Muslim (in India) ‘to glimpse the positive character of the age which was coming’. But in his attempt to create the aforementioned synthesis, Iqbal was somewhat critical of an excessive use of rationalism (in matters of faith) which Syed had championed. Iqbal explained that this did not mean he (Iqbal) was advocating irrationalism, but that too much rationalism in this context could create cleavages within a larger (but varied) community of people with a shared religious history. To him, too much rationalism stopped members of the community from enriching themselves through the exchange of differing cultural values. Though Iqbal was highly appreciative of the fact that Syed’s endeavours had put so many Muslims in schools, colleges and universities, he lamented that these Muslims had submerged themselves too much in (European) values which contradicted those present in their (Indian) culture and religion (Islam). Iqbal believed that this had uprooted them from the collective history of their own land and community. In a way, Iqbal was lauding Syed’s reformist spirit and modernist outlook, but at the same time lamenting that those Muslims who had been rescued from religious obscurantism and social stagnation by Syed’s deeds, had thoughtlessly hurled themselves to the other side of the divide which was populated by European political and social ideas, which, to Iqbal, were ‘alien’ to the historical cultural make-up of the Muslims. 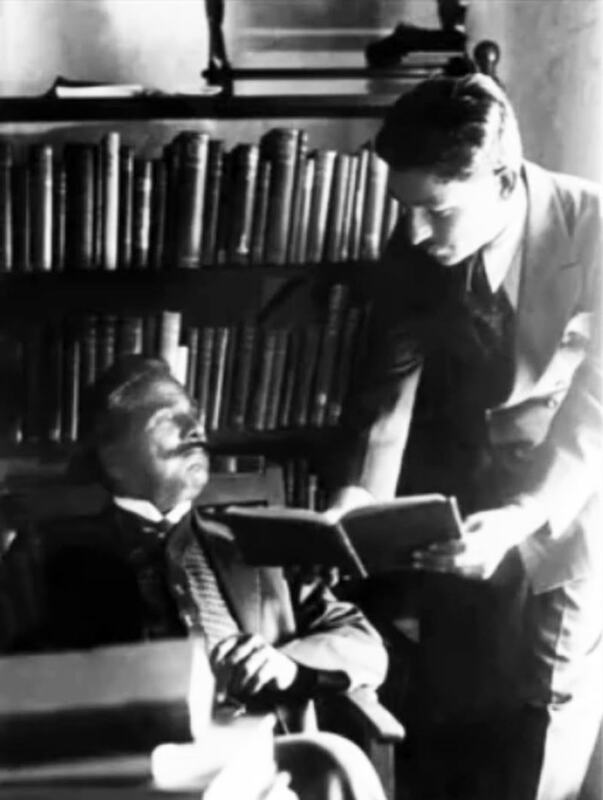 Iqbal (L) in his study. Iqbal then turned towards the idea of Muslim nationhood which was opposed to Syed’s reformist, rationalist and modernist propensity. He agreed that the Muslims of India were part of a larger global Muslim nation (ummah), and that Islam cannot be separated from their everyday lives (as Syed might have suggested). Nevertheless, Iqbal believed that this idea was being upheld by men who wanted to retain a stagnant and dogmatic status quo. Iqbal maintained that the only way Muslim distinctiveness in India can be realised was through a jolting rejuvenation of Islam and the ‘ethical education of the Muslim masses’. He wrote that this duty was in the hands of ‘half-educated religionists’ and regressive clerics (mullahs). He wanted this obligation to be snatched away from them and put in the hands of the new Muslim man which he was out to create. Cobwebs of religious dogma and obscurantism on the one side, and a blind adherence to European ideas and values on the other, had to be done away with. Doing this would be the new Muslim man — an individual who was morally and politically strengthened by a self-affirmation that inspired collective action. The self-affirmation was to be gained from self-realisation and/or a firm and clear realisation of one’s inherent ethical and spiritual strengthens buried underneath the weight of ignorance and materialistic distractions. Iqbal called it khudi — a powerful expression of informed individualism.Khudi was inspired by the study of the ego by German philosophers such as Nietzsche and Hagel, but Iqbal presented it as an attribute which did not lead to selfishness and conceit, but to the spiritual and intellectual blossoming of a human being, and, consequently of the community he was a part of. The idea first appeared in its matured form in Iqbal’s 1915 book, Asrar-i-Khudi (The Secrets of the Self). In it he asserted that God had created man and blessed him with khudi so that he is fit for the role of being His vicegerent on earth. To Iqbal, it is this very concept of khudi which when awakened in someone, revolutionises the person and also provides human society with the true essence and meaning of existence. The new Muslim man was thus unable to agree to or create a sense of nationhood which did not include his community’s cultural distinctiveness. And for a Muslim, this also meant the inclusion of Islam as a polity, and not just a label. The new Muslim man’s purpose was to discover his khudi by demolishing the torpors of obscurantism, dogmatism and inertia. He was then to inspirekhudi in his community, which, in turn, would inspire the community to turn itself into a polity driven by a dynamic, evolving and progressive Islam. This process will lead to the creation of a powerful nation of forward-looking and motivated Muslims who would be able to convincingly and effectively challenge European colonialism, economic exploitation and western political ideas, which, to Iqbal, had become ‘morally bankrupt’. Iqbal, though, never shied away from confessing the impact certain European philosophers had on him. 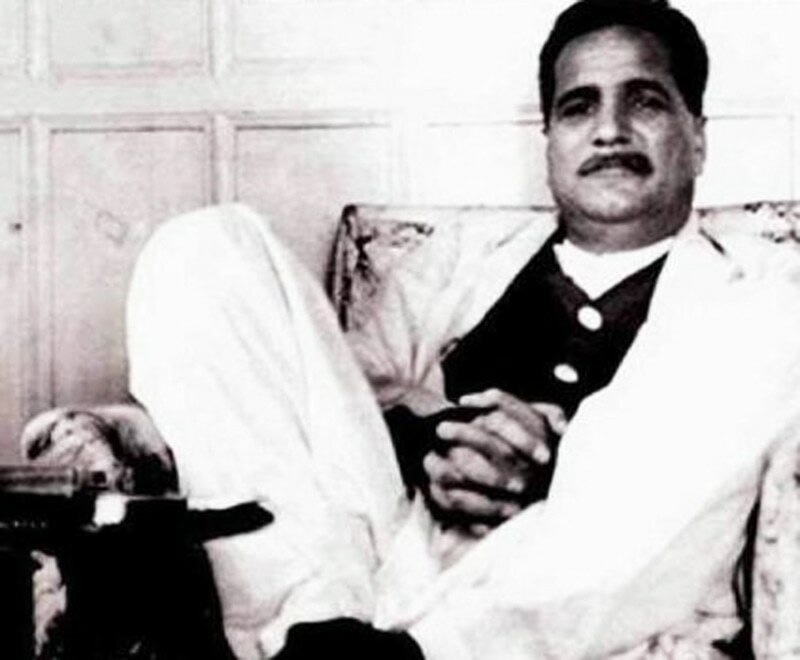 What’s more, in dealing with the western idea of parliamentary democracy, Iqbal suggested that it (democracy) was ‘a political ideal in Islam’. Nevertheless, he lambasted how the west had been practicing it because the system depended more on weight and numbers and sacrificed individualism and talent. So what was the new Muslim man to do, since he was supposed to also reject the ideas and institutions of kingship, monarchy and clergy? Iqbal wrote that the self-realised and rejuvenated Muslim polity should elect a national assembly made up of members who were well-versed in both Islamic as well as modern (secular) sciences, laws and philosophies. Such an assembly will make sure that the spiritual as well as political and economic interests and issues of the polity are advanced and resolved according to the progressive and dynamic spirit of its faith; and a consensus(ijma) is reached which is representative of the whole community which might otherwise have ethnic and sectarian divisions and its members may follow different schools of Islamic jurisprudence. Iqbal was a thorough idealist, a glorious romantic in the guise of an ideologue and a reformist. His new Muslim man was to be an unprecedented being in the Muslim universe. This new man was to offer a bold challenge — to the ‘morally bankrupt’ but ubiquitous ideas of the modern western man; to the dogmas and intransigent attitude of the old Islamic man; and even to the ascetic disposition of the Eastern spiritual man (Sufi). Yet, much of Iqbal’s thinking revolves around abstract concepts and ideas of the human psyche. But he insisted that they were sprouting from physical historical events and currents, especially those related to Muslim history. And even though his new Muslim man was to be a thoughtful being who had overcome religious dogma and the indoctrination of ‘alien ideas’ to realise his full intellectual and spiritual potential, he was to be an entirely social entity, capable and willing to positively interact with society. Yet, the process one had to go through to spark his khudi and become the new Muslim man, in essence, is a metaphysical pursuit. Thus, the new Muslim man, too, is a mystical being, but one who rejects the more established and traditional routes of mysticism and replaces it with one which expresses itself as a more extroverted and even political countenance. The new Muslim man realises his potential through intellectual introspection, but wasn’t introverted or cut off from society. To Iqbal, the whole idea of the annihilation of the ego in Sufism was detrimental to the pursuit of discovering khudi. The ego was vital to the new Muslim man because he had transformed it into becoming a vivacious and constructive force of life, instead of a one-dimensional feature which led to conceit. Iqbal was a staunch individualist. 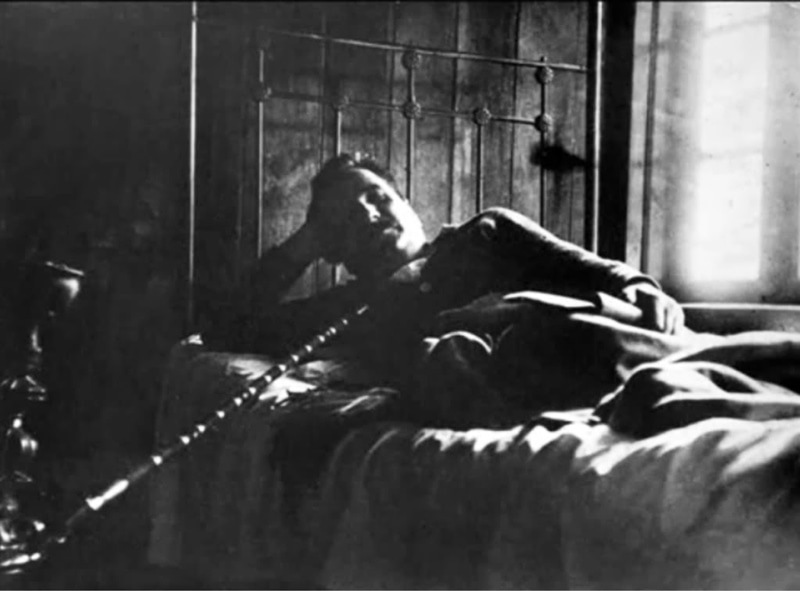 When he had suddenly dropped out of the Khilafat Movement, he was visited by a leader of the movement who found him relaxing on a sofa and smoking a hookah. So the question is, would the new Muslim man, who too was a radical individualist, change course once he had sparked the creation of a whole community of people driven by khudi? He has to continue to stand out; to not become part of the crowd, even after he had left them swaying. Such a dichotomy, or, rather, paradox, does not seem to bother Iqbal because to him the realisation of the khudi was an eternal process which one had to continue adding to and evolve. This is also why he was critical of ancient Islamic scholars such as Al-Ghazali (1058-111), and Ibn-i-Taymiyah (1268-1328), who cautioned against the dangers of philosophy (because too much of it might lead one to heretical, even, irreligious thought). Iqbal wrote that Islam was not opposed to Philosophy because the Holy Quran urged believers to reflect upon God’s creations and to peruse knowledge for the sake of it. Iqbal did not see Islam and its holy scriptures as a ‘block universe’; instead he saw them as processes of ‘continual actualisation’. Iqbal and his new Muslim man was to reconcile faith with the realities of the now and the here. Like Sir Syed Ahmad Khan, Iqbal, too, was a steadfast advocate of interpreting the scriptures according to the realities of the day. To him, the Holy Quran was a dynamic work which could be ‘reconciled to the environment which humanity finds itself’. He lamented that the quality of Islamic scholarship in the Muslim world was such that it was unable to dynamically, rationally and imaginatively interpret the scriptures according to the realities of modern times. Iqbal’s ideas were highly complex yet extremely bold and modernistic. And even though these ideas did ruffle feathers in various sections of the conservative ulema community, their (the ulema’s) anger towards him was not as pronounced as it had been against Sir Syed Ahmad Khan. Dr M Khalid Masud in his essay — Iqbal’s Reconstruction of Ijtihad — noted that Sir Syed had used the word ‘reformation’ to explain his iconoclastic ideas, which made the conservatives believe that he was somewhat changing the doctrines of Islam. Iqbal on the other hand, consciously used the term ‘reconstruction’ which did not carry the same negative perception (in the minds of the ulema) as the term reformation had. But both Syed and Iqbal were urging the Muslim community to widen, modernise and evolve Islamic theology. But whereas Syed was trying to mold and shape the Muslim community as an enlightened cultural entity, Iqbal was doing the same, but also further transforming it into becoming a vibrant polity and political entity. Though Iqbal’s passion to rejuvenate all aspects of Islam through introspection and study — enough for the concept of khudi to emerge in the Muslim community and turn it into a progressive polity — remained a constant, he wasn’t immune to often change his mind and ideas. He fell in and out with pan-Islamism; with the secular Turkish republic of Mustafa Kamal; and with modernism and as well as orthodoxy. Dr Masud wrote that ‘while the conservative Muslim critics find Iqbal departing radically from tradition; Western scholars criticise him for his conservatism. But his philosophical undertaking was rather weighty. He tried to reconcile and then merge rationalism with religious emotionalism and instinct. Looking to transform the Muslim community into a distinct polity, Iqbal, unlike Sir Syed, was not repulsed by politics. He was a prominent member of the Muslim League who often contested elections. In December 1930, while speaking at a party convention in Allahabad, Iqbal finally announced what he expected the Indian Muslim polity to do. This is a remarkable statement which was increasingly downplayed during the post-1970s’ rise of the more myopic narrative of Pakistani nationalism. The statement clearly suggests that Iqbal saw the Indian Muslim community and polity to lead the way in rejuvenating a stagnating faith according to modern times, and, in the process, neutralise the impact of ‘Arab imperialism’ on it. • Amir Riaz: Alama Iqbal aur Thereek-e-Khilafat (Daily Dunya, August 7, 2013). • Muhammad Iqbal: The Reconstruction of Religious Thought (first published 1930). • Wayne A. Wilcox: The Wellsprings of Pakistan in Pakistan: The long View ed. L. Ziring (Duke University Press, 1977).